This post is sponsored by Floor & Decor but all opinions are 100% my own. Besides sweat equity, we haven’t really spent a lot of money on our kitchen reno. Yeah, we’ve bought some paint and wood for the ceiling and cabinet, but we haven’t broken the bank. The money-spending phase is about to begin though. On the list…pick out and purchase countertops, backsplash tile, a kitchen sink, and recessed lights, and the first item to get checked off that buy list was the tile. Yes, we got tile! A couple of weeks ago, we took a little shopping trip to finally pick out and purchase some tile for the backsplash. I’ve been waiting to do this for a long time and the day finally arrived. 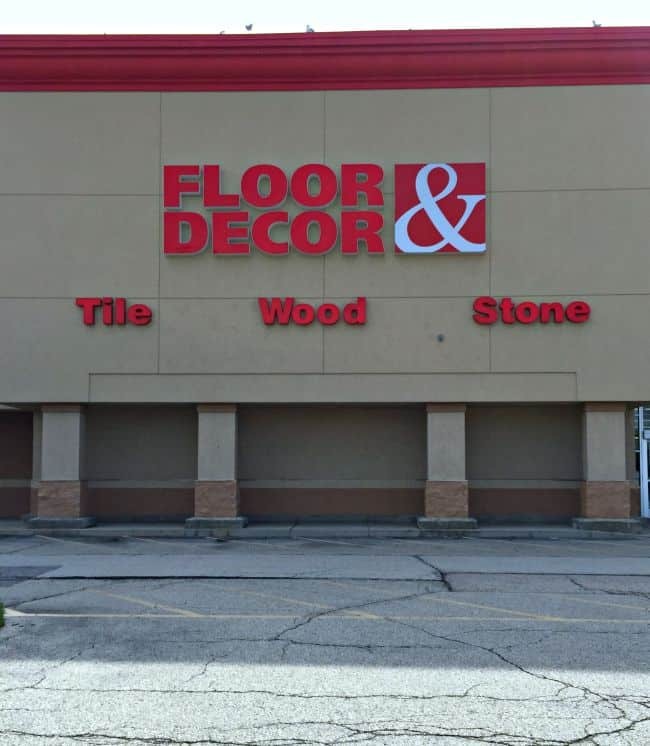 We’ve been looking at tile all over town for several months now, but when Floor & Decor contacted me about partnering with them, I was excited to check them out to see what they offered and get this tiling show on the road. I thought I knew what I wanted, but when we walked in and saw all that tile, I wavered for just a minute. All I can say is wow…the store was massive…over 100,000 square feet massive. Tile displays, wood flooring displays and even countertop options are all offered. They say you need to “see it to believe it” and I totally agree. After a quick look at some displays, we were greeted by Nicole, the store’s assistant manager of operations, and our shopping began. Even though this shopping trip was planned, we have been to other stores since and there were always employees walking around the store ready to help if you need it, plus they offer free design services. My plan all along was to get white subway tile, something I’ve always wanted but have never had in any of the 10 homes I’ve lived in. After a brief moment of doubt, I knew that I needed to stick to the plan, so we figured out how much we needed and picked out our subway tile. Quick, easy and done. 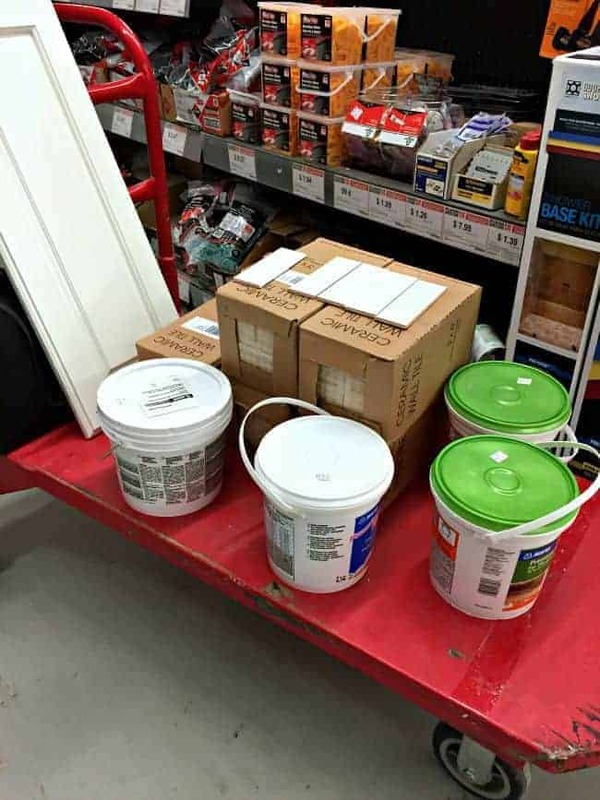 We found that Floor & Decor’s tile was comparatively priced to other stores and they carry a huge selection in stock, so we had no trouble taking home everything we needed for the backsplash, including gray colored grout and a few other necessities. After we picked out our tile and supplies, we moved over to the countertop options to see if we could make a decision on what we wanted. We brought one of our painted cabinet doors with us and used a sample tile to see how some of the countertops looked with our colors. Nicole walked us through all of the options that they offered and helped us narrow it down to a couple of countertops that would work well in our kitchen. 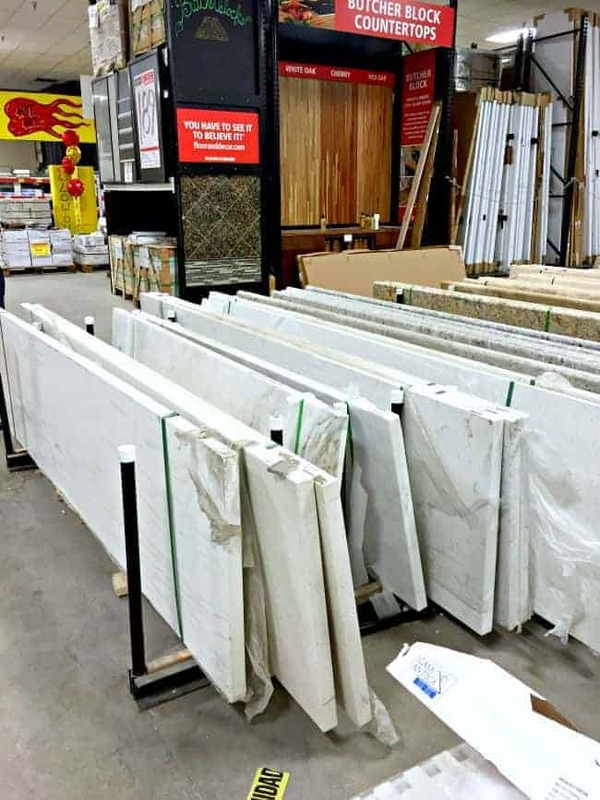 Floor & Decor has pre-cut countertops already in stock, offering marble, granite, quartz and even some beautiful butcher block countertops in several different sizes. Just pick out what you want and take it home. You will need to get it cut and installed by a professional if you can’t or don’t want to do it yourself but, if you do decide to do it all on your own, like we’re going to do, then the total cost is much lower. There were a few options that we both liked, at a great price, so I’m hoping that we can go back for countertops. I may even be able to get the marble I’ve been wanting. We had a very productive shopping trip and now we can cross at least one item off the list. Once we finish painting the new cabinet, we can get countertops and then install our new tile. I can’t wait, I think I can almost see the light at the end of the tunnel. I’d love to know, which countertop do you like best with the cabinet door and tile…(A) the granite, or (B) the walnut butcher block? 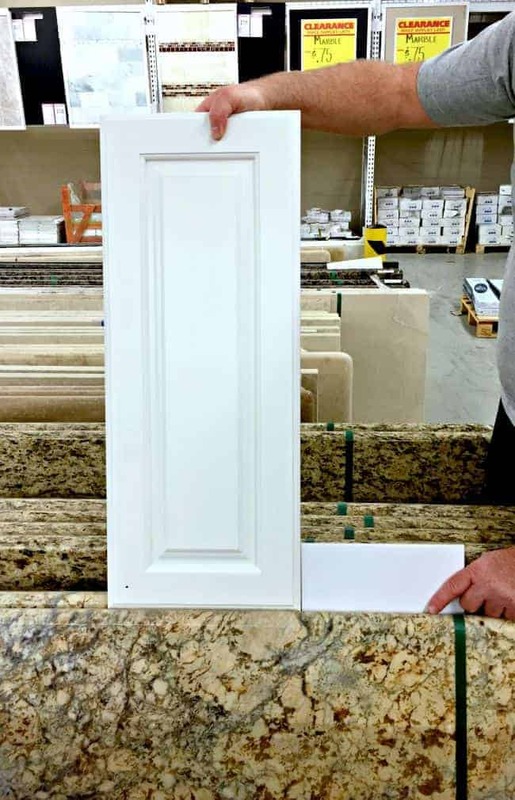 I have granite similar to your photo and my cabinets are similar, too, except they’ve been antiqued… I couldn’t love the look or the maintenance factor more…. If I were trying to go more rustic farmhouse I’d probably choose the butcher block…. both so pretty you cannot make a bad choice! Thanks for weighing in Cindy. It’s great to get an opinion from someone who has and loves their granite countertops. It’s also good to know that maintenance isn’t an issue. 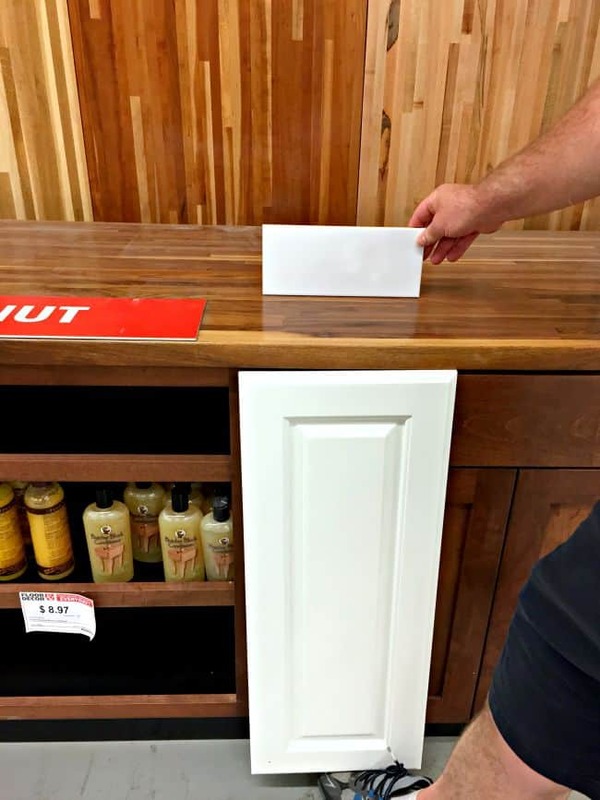 I would have to flip a coin….love both countertops, but the wood pops. I’m undecided too, Debby. Thanks for weighing in. I looked at “A” first and thought, “ooh, I like that.” Then I looked at “B” and said, “I like that too!” The butcher block is much warmer looking, but the granite is chic. Seeing your home and the way you decorate I think the granite will be more to your liking. I, personally would choose the butcher block since I like a more “farmhouse style”. I’m sure whatever you pick will look great and you will love it! I totally agree MJ. I love the warmth of the butcher block but the granite is more my style. You know my style well. 😉 Thanks for sharing your opinion. Hope you enjoy your week off. I went into Floor and Decor the other day looking for lighting. They didn’t have anything, but I was amazed at the amount of tile, flooring, and countertops they had. I would go with the granite or marble. Classic and good for resale. So true about resale Jennie and with our moving track record, that’s a huge consideration. Thanks for weighing in. Marble looks great, but if I could re-do my kitchen I would have gone with ceasarstone where my marble is right now. Good luck ! Thanks Vel. Marble does look great. Just curious as to why Ceasarstone over marble? I have ceasarstone on the rest of my counters and they have been fabulous, no scratches, no marks, so easy to clean! Yes, very true. Thanks Molly! I like the granite, but the walnut might look nice especially with the ceiling you have in the kitchen now. Looks great, Kristi! I think whatever you pick will be fabulous, but I am a wood girl. I think it’s so warm and classic. Wood is warm and classic. Thanks for weighing in Kim. Much appreciated! Thanks Phyllis. I appreciate your opinion. Hope you have a great week! The walnut sure is pretty. Thanks for weighing in Debbie!